"Quinn the Eskimo (The Mighty Quinn)" is a folk-rock song written by Bob Dylan and first recorded during The Basement Tapes sessions in 1967. 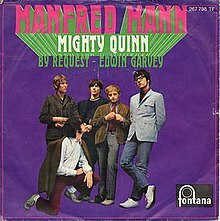 The song was recorded in December 1967 and first released in January 1968 as "Mighty Quinn" by the British band Manfred Mann and became a great success. It has been recorded by a number of performers, often under the "Mighty Quinn" title. "By Request – Edwin Garvey"
(1968) "Theme from 'Up The Junction'"
"The Mighty Quinn (Quinn the Eskimo)"
The subject of the song is the arrival of Quinn (an Eskimo), who changes despair into joy and chaos into rest, and attracts attention from the animals. Dylan is widely believed to have derived the title character from actor Anthony Quinn's role as an Eskimo in the 1960 movie The Savage Innocents. Dylan has also been quoted as saying that the song was nothing more than a "simple nursery rhyme". A 2004 Chicago Tribune article also claimed that the song was named after Gordon Quinn, co-founder of Kartemquin Films, who had given Dylan and Howard Alk uncredited editing assistance on Eat the Document. Dylan recorded the song in 1967 during the Basement Tapes sessions, but did not release a version for another three years. Meanwhile, the song was picked up and recorded in December 1967 by the British band Manfred Mann, who released it in early 1968 under the title "Mighty Quinn". The Manfred Mann version reached #1 in the UK Singles Chart for the week of 14 February 1968, and remained there the following week. It also charted on the American Billboard chart, peaking at #10, and reached #4 in Cash Box. A later incarnation of Manfred Mann, Manfred Mann's Earth Band, included a dramatically different live version of the song on their 1978 album Watch. The single edit omitted the prog middle part (previously released as a standalone instrumental under the title "As Above So Below" on 1975's Nightingales & Bombers) and included a few new guitar solos. Afterwards, the song has appeared on numerous live recordings, the middle part often including long solos and/or snippets of other songs. "As Above So Below" has been replaced with "Oh Well" and in recent years, the band often quoted "Smoke on the Water" as well before returning to the main hook. Therefore, "Mighty Quinn" repeatedly goes on for over ten minutes live. A demo of 14 of the 1967 Basement Tapes recordings, including the first of two takes of "Quinn the Eskimo (The Mighty Quinn)", was produced in 1968, but was not intended for release. Recordings taken from the demos began appearing on bootlegs, starting with Great White Wonder, a double-album bootleg that came out in July 1969. The first official release of the song was in 1970 on Dylan's Self Portrait album, a live recording from 1969's Isle of Wight Festival. The live version was also selected in 1971 for the second compilation of Dylan's career, Bob Dylan's Greatest Hits Vol. II. When Columbia finally released The Basement Tapes in 1975, the song was not among the double-album's 24 songs (although an Inuk was represented on the album cover, alongside Dylan, The Band, and several other people meant to represent certain characters from some of Dylan's songs). However, ten years later in 1985, the second of the two 1967 takes appeared on the 5-LP Biograph set (this time titled "Quinn the Eskimo (The Mighty Quinn)"). This version was used again on The Essential Bob Dylan, a compilation released in 2000. The first of the two 1967 takes was not officially released until 2014, on The Bootleg Series Vol. 11: The Basement Tapes Complete. The Manfred Mann version is noted for Klaus Voormann's use of a distinctive flute part. This was replaced in the Earth Band version with Manfred playing it on an organ. Kris Kristofferson covered the song in 2012 for Chimes of Freedom, in honor of 50 years of Amnesty International. The first release of the song, the #1 hit by Manfred Mann, which topped the UK charts in February 1968, was released as "Mighty Quinn". When Dylan released a live version of this song on his album Self Portrait, in June 1970, the song was titled "The Mighty Quinn (Quinn the Eskimo)". This title was repeated when the same live recording was released on the album Bob Dylan's Greatest Hits, Vol. 2 in November 1971. When Dylan's original "basement tapes" recording of the song, backed by The Band and recorded in West Saugerties, New York in 1967, was eventually released as part of the compilation album Biograph, in 1985, it was entitled "Quinn the Eskimo (The Mighty Quinn)"; this is the title according to the song on the official Bob Dylan website. Although they never played the song with Bob Dylan, The Grateful Dead started playing "The Mighty Quinn" in concert in 1985. It became a favorite encore among the Grateful Dead's fans, and remained so to the end of their career. In 1969, The Hollies put their own spin on "The Mighty Quinn," adding a prominent banjo accompaniment, a horn section, and a flute part in reference to Manfred Mann's version. The song was featured as the last song on Side 2 of Hollies Sing Dylan and was performed in concert in 1969 alongside "Blowin' in the Wind". Leon Russell included a version in a medley with "I'll Take You There", "Idol With the Golden Head" and "He Lives (I Serve a Risen Savior)" that opens his album Leon Live. Dylan makes reference to the song in his 2004 autobiography Chronicles Volume One: "On the way back to the house I passed the local movie theater on Prytania Street, where The Mighty Quinn was showing. Years earlier, I had written a song called 'The Mighty Quinn' which was a hit in England, and I wondered what the movie was about. Eventually, I'd sneak off and go there to see it. It was a mystery, suspense, Jamaican thriller with Denzel Washington as the Mighty Xavier Quinn a detective who solves crimes. Funny, that's just the way I imagined him when I wrote the song 'The Mighty Quinn,' Denzel Washington." Dylan's chorus is featured in the movie, with different verses, since the movie's Quinn is not an Eskimo. "The Mighty Quinn" is also the main theme music for English Premiership Rugby Club Harlequins AKA "Quins", where the version by Gotthard is mainly used. In the Young Sheldon episode "An Eagle Feather, a String Bean, and an Eskimo" Sheldon refers to the song as "hippy folk music" and states, "shame on whoever wrote that" in reference to the lyric "You'll not see nothin'". The band State Radio refers to "Quinn the Eskimo" in the first stanza of their song *Fall Of The American Empire*: "Did you get the invitation? The swan song of a nation, Everyone's waiting for you inside. We got soda pop and hickory stills. Quinn the Eskimo in espadrilles, And Sally makin' you feel alright." The band Phish has also covered the song "Quinn the Eskimo". They played it most frequently in 2011 & 2012. It has become more of a rare cover in the years since. ^ a b c Rice, Jo (1982). The Guinness Book of 500 Number One Hits (1st ed.). Enfield, Middlesex: Guinness Superlatives Ltd. p. 114. ISBN 0-85112-250-7. ^ Oliver Trager, Keys to the rain: the definitive Bob Dylan encyclopedia, Billboard Books, 2004, pp.505-6. ^ a b Gilliland, John (1969). "Show 54 - Hail, Hail, Rock 'n' Roll: Getting back to rock's funky, essential essence. [Part 3]" (audio). Pop Chronicles. University of North Texas Libraries. ^ "Manfred Mann No.1 in the UK on 14 February 1968 with "Mighty Quinn" for 2 weeks". Archived from the original on 8 April 2008. Retrieved 9 January 2007. ^ "Quinn The Eskimo (The Mighty Quinn) | The Official Bob Dylan Site". Bobdylan.com. Retrieved 2 October 2016. ^ "Austriancharts.at – Manfred Mann – Mighty Quinn" (in German). Ö3 Austria Top 40. ^ "Swisscharts.com – Manfred Mann – Mighty Quinn". Swiss Singles Chart. ^ "Nederlandse Top 40 – Manfred Mann" (in Dutch). Dutch Top 40. ^ "Dutchcharts.nl – Manfred Mann – Mighty Quinn" (in Dutch). Single Top 100. ^ "Topp 20 Single uke 9, 1968 – VG-lista. Offisielle hitlister fra og med 1958" (in Norwegian). VG-lista. ^ "Chart Track: Week 9, 1968". Irish Singles Chart. ^ "Manfred Mann Chart History (Hot 100)". Billboard. ^ "Offiziellecharts.de – Mann, Manfred – Mighty Quinn". GfK Entertainment Charts. ^ Dylan, Bob (2004). Chronicles Volume One. Simon & Schuster. p. 187. ISBN 0-7432-3076-0. Heylin, Clinton (2003). Behind the Shades Revisited. Harper Entertainment. ISBN 0-06-052569-X. Trager, Oliver (2004). Keys to the Rain. Billboard Books. ISBN 0-8230-7974-0. Nixon, Stu (1999). Deadbase XI. Deadbase. ISBN 1-877657-22-0. Lyrics to "Quinn the Eskimo (The Mighty Quinn)"